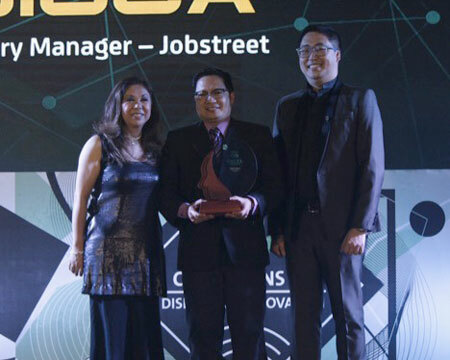 JobStreet Philippines Country Manager Philip Gioca (center) receives his award from IABC Philippines Vice President and Chairman of the CEO Excel Awards 2017 Belle Tiongco (left) and IABC Philippines Chairman Kane Errol Choa (right). Under his tutelage, JobStreet Philippines has furthered its leadership position in the industry, presenting an average of 60,000 jobs posted monthly by as many as 24,000 employers across key industries and business sizes. To date, 7.6 million candidates have registered to the online portal. He has also overseen the rollout of several innovations such as richer job ads with the inclusion of vital information such as salary data, Talent Search, Company Reviews, and the LiNA bot. With his zeal for innovation and progress, Gioca has overseen the digitization of various traditional offline channels for job search and enablement. Government jobs, a growing labor market segment, has been added to JobStreet Philippines’ already vast number of job listings. Nearly 100 government agencies have posted as much as 3,500 jobs since July 2017, which are all housed on a one-stop microsite, making the process of applying to government jobs more transparent and accessible. He has also championed Overseas Filipino Workers by making the Pre-Employment Orientation Seminar (PEOS) online in cooperation with the Philippine Overseas Employment Administration, which is now mandatory to all intending to explore job opportunities abroad. In the spirit of nation-building, he establishes collaboration with government, NGOs as well as private institutions to increase the reach and access to available job opportunities in the country and help address job skills mismatch. Under his leadership, JobStreet recently partnered with the Office of the Vice President to further grassroots jobs generation and matching by supporting the Angat Buhay Program. JobStreet also partnered with Edukasyon.ph, a social enterprise that helps high school students make better-informed career choices from education to employment. The wealth of the company’s proprietary digital data has also been turned into empowering labor market insights. Philip has been a thought leader, acting as JobStreet’s spokesperson for job market insights and trends. He has presented JobStreet’s Job Happiness Report, Top Companies Report, Fresh Graduate Report, Job Outlook and Trends Report, and Bonuses Report in various industry, media, and campus events.